Mark R. Proctor and Peter M. Black, eds. Humana Press; 2005, 431 pages, $175. 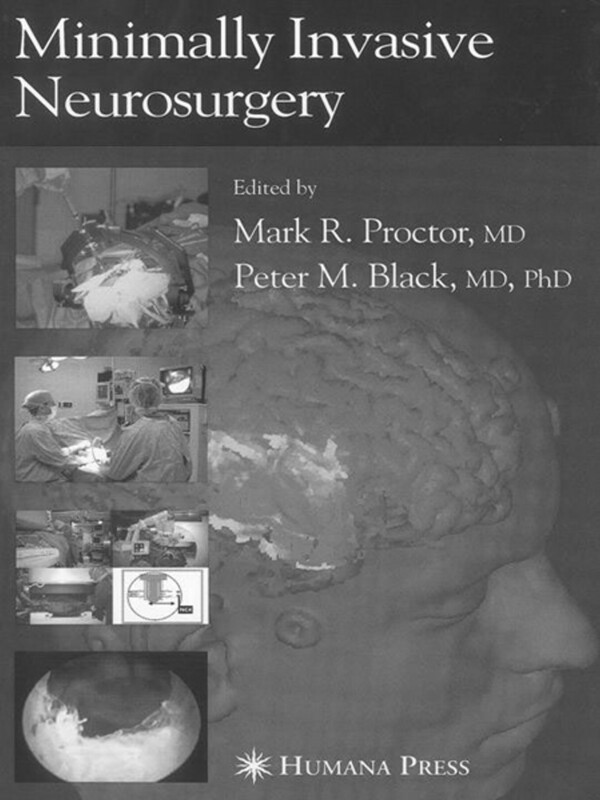 This book is a multiauthored collection of 20 chapters, divided into 2 parts, reviewing the techniques (part 1, 14 chapters) and current applications (part 2, 6 chapters) for different image-guided neurosurgical and endovascular procedures. A better title might have been “Image-Guided Neurosurgery” or “Image-Guided Neurointervention.” The range of procedures considered to be minimally invasive is broad. For example, a chapter on open craniotomies for brain tumors by using intermittent intraoperative MR images for guidance is included in this text. The 2 editors and many of the authors of this book hail from the Departments of Neurosurgery and Neuroradiology at Children’s and Brigham and Women’s Hospitals in Boston. The inclusion of intraoperative MR in the book reflects their experience: they have been one of the major centers developing this technology. A brief outline of the table of contents will illustrate the diversity and wide scope of the book. The first chapter is a good review of technical aspects and applications for intracranial endoscopy. The next 3 chapters review MR physics (an excellent, well-illustrated chapter), MR spectroscopy (a very superficial treatment), and different techniques of functional imaging. The remaining 10 technique chapters discuss particular image-guided procedures: 3 chapters on endovascular intervention for aneurysms, arteriovenous malformations (AVM), and stent placement, respectively, and chapters on intraoperative MR, percutaneous radiofrequency rhizotomy for trigeminal neuralgia (excellent), radiosurgery for AVMs and tumors (also very good), frameless stereotaxy, MR-guided hyperthermia, and viral vectors. Several of these chapters are excellent, as noted above. Part 2—“Specialties”—contains 6 chapters, divided into minimally invasive applications in pediatrics, vascular, oncology, spine (excellent), peripheral nerve (carpal tunnel), and brain trauma. The intent of these chapters is to frame the current field of each of these neurosurgical subspecialties and provide some context for the current roles of these different procedures. Unfortunately, this book suffers from several major flaws. The quality, length, and depth of the chapters vary widely. Some chapters have no illustrations. The inclusion and exclusion of different procedures seems random. The definition of minimally invasive, and of neurosurgery, is in the eye of the beholder, apparently. I would not consider MR-guided craniotomy for tumor to be minimally invasive. Percutaneous tracheotomies and gastrostomies are less invasive than open procedures, but they are not really neurosurgical procedures (chapter 20). Chapters on the techniques and subspecialties of functional neurosurgery—including pain, movement disorders, and epilepsy surgery—are missing. In addition, there is a great deal of overlap, redundancy, and inconsistency between the information found in the technical chapters of part 1 and subspecialty overview chapters of part 2. Examples include the treatment of endoscopy in chapters 1 and 15 and the discussion of endovascular treatment of aneurysms in chapters 7 and 16. Chapter 16, “Vascular Neurosurgery,” is written from a microneurosurgical, rather than endovascular, perspective. Several techniques for reducing morbidity from open craniotomy are discussed in this chapter, including actual and potential advances in neuronavigation, retraction, and robotics. These methods are not mentioned in the techniques section. The chapter on an endoscopic technique for carpal tunnel surgery is included as a specialty (peripheral nerve) and not a technique. Some of these chapters will have some value for neurosurgery residents. In particular, the chapters on endoscopy, MR physics, endovascular intervention, spine intervention, percutaneous rhizotomy, and radiosurgery are very well written and practical. Much of this information, however, is available from other sources. Neuroradiologists may be interested in the chapters on MR-guided craniotomy and hyperthermia. I would not recommend this book for neuroradiology fellows or radiology residents.